Every once in a while, I love to play around with the classic No-knead bread recipe — adding bits of this and that, switching out the flours, playing around with the amount of yeast, etc. As finicky as some gluten-free breads can be, this one is surprisingly adaptable … within reason. 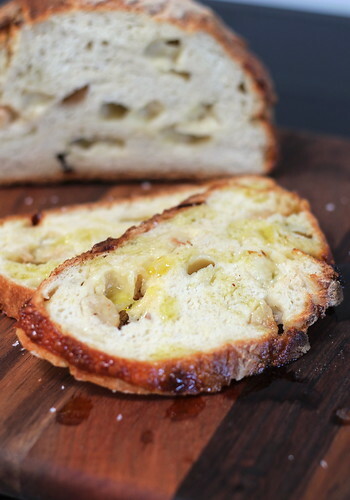 This time around, I was inspired by the white cheddar-garlic loaf loaf from Great Harvest, and armed with a jarful of garlic confit I was already half way there. Freezing the cloves and cheddar cubes means that upon cutting into the loaf you’ll be presented with pockets of melty cheese and still-intact garlic cloves, instead a mildly cheesy, garlicky flavored bread. I love to serve slices when it’s still warm with a drizzle of the garlic-infused oil and a sprinkle of flaky sea salt — it’d definitely be great paired with a hot bowl of tomato soup on a chilly fall night! 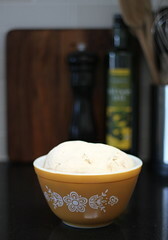 In the bowl of a stand mixer, whisk together millet flour through evaporated cane juice. In a measuring cup with spout, combine the water and vinegar. Fit the mixer with paddle attachment and turn on to low speed. Pour water and vinegar into the dry ingredients and continue to mix on low speed until the flour is mostly incorporated. Increase the speed to medium and beat for 2 minutes. Turn the dough out onto a millet floured surface. Sprinkle the top with more millet flour, then roll the dough around a little, covering all sides with flour. 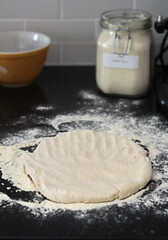 Pat the dough into a disk, roughly 3/4-1″ thick (no need for perfection here!). Scatter frozen garlic confit cloves and cheese over the surface. Fold the top “side” into the middle of the circle, then the left and right sides into the middle, and finally, the bottom into the center to make a squared ball-like shape. Gently pinch the resulting seam together to seal. 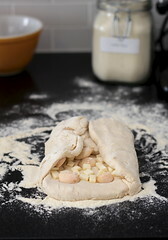 Flip the dough over and roll it around a little more to eliminate any remaining seams. (If you need to start over with the disk/folds/rolling into ball process, don’t worry. Just try to make sure that the majority of the garlic and cheese pieces are covered by dough so they don’t overcook in the oven.) Place the formed dough into a small bowl (about 1 liter in capacity), and drape a piece of plastic wrap gently over the dough—not just over the top of the bowl. Let dough rest about 4 hours at room temperature. Inside a microwave or on the top of the refrigerator are typically two good, draft-free spots. 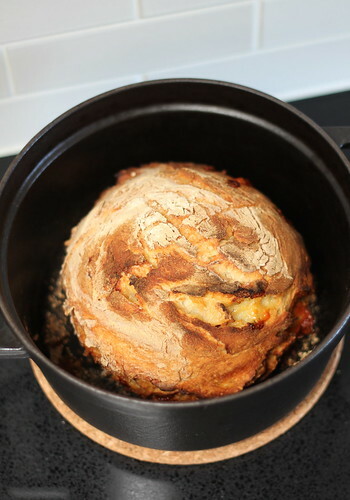 At least 30 minutes before the dough is finished rising, place a 2-3 quart cast iron Dutch oven and its lid¹ on the center rack of the oven and pre-heat to 450°F. When the dough is ready, carefully remove the hot pot from oven and set lid aside. Sprinkle cornmeal evenly over the bottom of the Dutch oven. Gently invert the dough into the pot (if it happens to touch the side and stick, shake the pan gently to get it centered and unstuck). 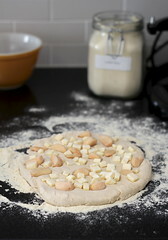 With a sharp knife, make two intersecting slashes in the top of the dough (each about 1/2″ deep and 3″ long). Cover the pot and bake for 30 minutes, remove the lid and bake, uncovered, until the loaf is deep golden brown, about 5 – 10 minutes. Cool for about 30 minutes on a rack before cutting into the loaf. The bread is best eaten warm, about 30 minutes after removing from the oven. After the bread has cooled slightly, I recommend cutting slices then drizzling (or brushing) each with a bit of the garlic-infused oil and sprinkling a touch of Maldon sea salt and/or freshly ground black pepper over top. Once loaf has cooled to room temperature, wrap with plastic wrap and store in the fridge. Reheat slices in a 350° oven for about 5 minutes. Another option, brush with garlic oil and place on a skillet over medium heat to toast/warm. ¹ I use a Staub 2.25 Quart Round Cocotte — it’s heavier than most cast iron pots and also enameled (though it doesn’t look it), which requires less maintenance than a non-enameled pot. 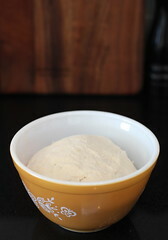 You may also bake it in a larger pot; it’s the bowl that the dough rises in that gives its shape, not the baking vessel. Hi! I was wondering if I could let the dough rise over night instead of just 4 hours? would I have to put in the fridge or is it okay left at room temp?